Myxopapillary ependymomas comprise nearly 90% of all primary neoplasms involving the cauda equina, conus medullaris, and filum terminale. Myxopapillary ependymomas that are confined to nerve roots are exceedingly rare. We describe a young patient who presented with low back pain and radiculopathy and an intradural lesion at the L2 vertebral level. Ultimately, an intradural extramedullary tumor on the left L4 nerve root was completely resected. Pathology revealed a well-differentiated WHO Grade 1 myxopapillary ependymoma with well-defined perivascular pseudorosettes. Postoperatively, the patient had complete resolution of her symptoms and no radiographic evidence of residual or recurrent disease. Although rare, it is important to keep ependymomas in the differential for lumbosacral nerve root tumors. Surgical resection offers the patient both a definitive diagnosis and potential symptom reduction. It is also important for the surgeon to be aware that these ependymomas can be both multifocal and malignant. We present the third case ever of an ependymoma confined to a spinal nerve root. Ependymomas are the most common gliomas of the distal spinal cord, comprising nearly 90% of primary neoplasms involving the cauda equina . The majority of these (83%) are of the myxopapillary subtype and occur at the conus medullaris, cauda equina, and filum terminale [2-3]. They are believed to originate from the glia of the filum terminale and can grow to involve the nerve roots of the cauda equina. Isolated nerve root myxopapillary ependymomas without concomitant or contiguous lesions involving the filum terminale are exceedingly rare. This is the third reported case of an isolated spinal nerve root ependymoma and the second case of myxopapillary ependymoma arising from a nerve root without continuity with the filum terminale [1-2]. This was a retrospective chart review and did not require an IRB approval. An informed patient consent was obtained for treatment. A 32-year-old female, with a past medical history of myoclonic epilepsy and total abdominal hysterectomy with salpingo-oophorectomy for endometriosis, presented with one month of severe mechanical low back pain associated with occasional bilateral lower extremity radiculopathy. 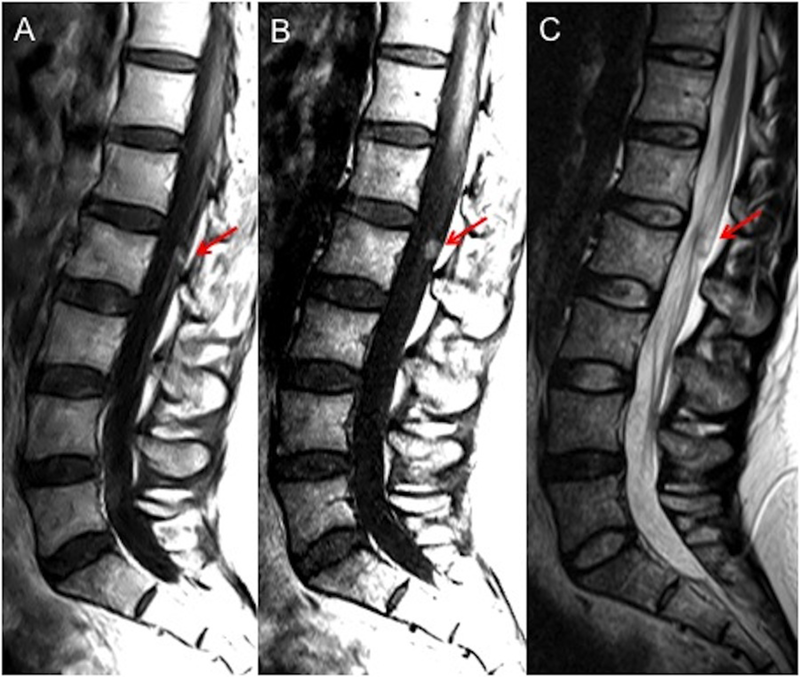 Magnetic resonance imaging of the lumbar spine was performed as a part of the work-up, and revealed an intradural extramedullary lesion at the level of the L2 vertebral body (Figure 1). Figure 1: Sagittal T1-weighted MRI (a) without and (b) with contrast demonstrating a contrast-enhancing well-circumscribed lesion at the level of the L2 vertebral body. (c) Sagittal T2-weighted MRI without contrast again demonstrating the lesion. 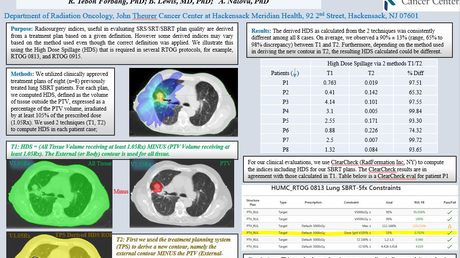 The remainder of the neuraxis was subsequently imaged with MRIs and found to be unremarkable, as was a metastatic tumor survey. On exam, the patient was neurologically intact without evidence of weakness or sensory deficits. Initially, serial imaging with periodic MRIs was proposed, but the patient was apprehensive about the possibility of malignancy; the decision was then made to take the patient to the operating room for biopsy, debulking, and resection of the intradural mass. Laminectomies at the L2 and L3 levels were performed, the dura opened, and an intradural grey-blue-appearing spherical lesion was encountered on the underside of a nerve root. Intraoperative neurostimulation of the nerve root indicated it was the left L4 motor root with tibialis anterior function. The tumor was soft and easily aspirated with gentle suction, and was subsequently resected in its entirety without sacrifice of the nerve root. The decision to avoid neurectomy was made primarily because the patient had no pre-surgical motor weakness, and intraoperative stimulation indicated tibialis anterior function was present in the nerve root. 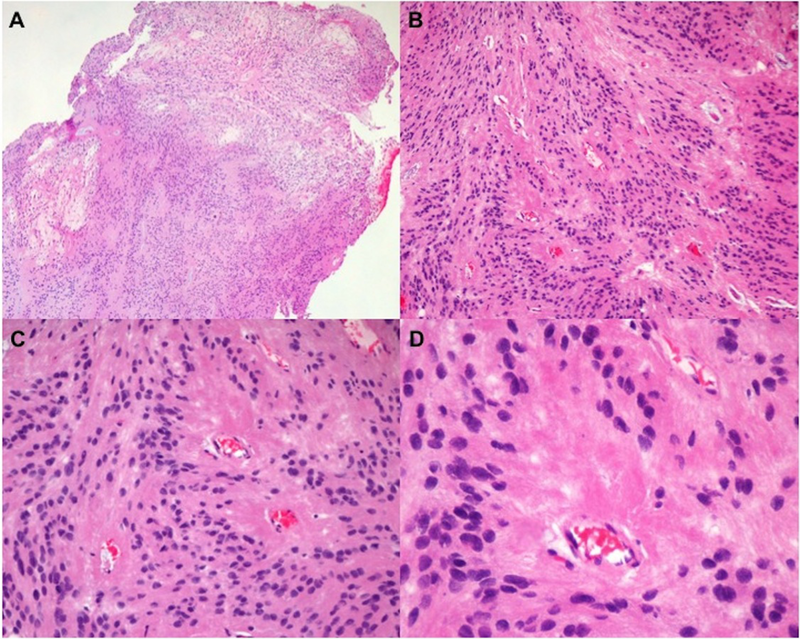 Pathology later revealed a well-differentiated WHO Grade 1 myxopapillary ependymoma with well-defined perivascular pseudorosettes (Figure 2). Postoperatively, the patient remained neurologically stable, and her back pain and paresthesias have since resolved. A six-month follow-up MRI was performed that confirmed gross total resection without evidence of residual or recurrence. Ependymomas are thought to originate from rests of ectopic ependymal cells . Some believe these ependymal cells were excluded from the neural tube during closure . Ependymomas represent over 90% of primary intradural tumors in the conus medullaris, cauda equina, and filum terminale. The majority of these are of the myxopapillary subtype [1-2, 6-7]. However, the overall incidence of primary intradural extramedullary ependymomas is quite low with less than 20 cases reported in the literature [1-2, 8-13]. Some of these were multifocal, while others were myxopapillary ependymomas. Most lumbar nerve root tumors are meningiomas or schwannomas, though cases of nerve root metastatic adenocarcinoma, melanoma, lymphoma, and sarcoma have been reported [14-16]. This is the third published case of an intradural extramedullary ependymoma isolated to a nerve root without attachment to the conus medullaris or filum terminale. Twenty-four cases of intradural extramedullary ependymomas have been reported to date. Two of these occurred exclusively in a lumbar nerve root: one was a WHO Grade 1 myxopapillary ependymoma and the other, a WHO Grade 2 ependymoma. It is critical to keep in mind that, although rare, ependymomas can undergo malignant transformation or even have multifocal origins. This elucidates the role of biopsy for histologic diagnosis and even resection for potential cure as well as the importance of serial follow-up, especially if postoperative radiation treatment is omitted. Although rare, it is important to keep ependymomas in the differential for lumbosacral nerve root tumors, especially because such a high proportion of primary intradural tumors in this location are ependymal in origin. It is also essential for the clinician to bear in mind that conus, filum, and cauda ependymomas can be both multifocal and malignant. Moser FG, Tuvia J, LaSalla P, Llana J: Ependymoma of the spinal nerve root: case report. Neurosurgery. 1992, 31:962-4. Bonfield CM, Amin D, Hamilton RL, Gerszten PC: Extramedullary ependymoma near the conus medullaris with lumbar nerve root attachment: Case report. Neurosurgery. 2011, 68:E831-E834. Louis DN, Cavenee WK, Ohgaki H, et al. : WHO classification of tumours of the central nervous system. Acta Neuropathol. 2007, 114:97-109. Kernohan JW, Fletcher-Kernohan EM: Ependymomas: a study of 109 cases. Tumours of the Nervous System: An Investigation of the Most Recent Advances. Zabriskie EG, Frantz AM, Hare CC (ed): Williams & Wilkins, Baltimore; 1937. pg 182–209. Kernohan J: Primary tumors of the spinal cord and intradural filum terminale. Cytology and Cellular Pathology of the Nervous System. Penfield W (ed): Hoeber, New York; 1932. 3:993–999. De Bonis P, Montano N, Cioni B, et al. : Primary extramedullary extradural ependymoma of the thoracic spine mimicking a schwannoma. J Neurol Neurosurg Psychiatry. 2009, 80:579-581. Kinsman MJ, Callahan JD, Hattab EM, Cohen-Gadol AA: Extramedullary spinal ependymoma: A diagnostic challenge and review of the literature. Clin Neurol Neurosurg. 2011, 113:661-664. Robles SG, Saldaña C, Boto GR, et al. : Intradural extramedullary spinal ependymoma: A benign pathology?. Spine (Phila Pa 1976). 2005, 30:E251-4. Tripathy P, Mohapatra D, Mohapatra S: Primary intradural extramedullary ependymoma: report of two cases and review of the literature. Neurol Neurochir Pol. 2011, 45:397-401. Vural M, Arslantas A, Ciftci E, Artan S, Adapinar B: Multiple intradural-extramedullary ependymomas: proven dissemination by genetic analysis. J Neurosurg Spine. 2010, 12:467-473. Tsai MC: Non-Hodgkin's B-cell lymphoma of a lumbar nerve root: a rare cause of lumbar radiculopathy. J Clin Neurosci. 2013, 7:1029-1031. Human subjects: Consent was obtained by all participants in this study. This was a retrospective chart review and did not require an IRB approval. Conflicts of interest: In compliance with the ICMJE uniform disclosure form, all authors declare the following: Payment/services info: All authors have declared that no financial support was received from any organization for the submitted work. Financial relationships: All authors have declared that they have no financial relationships at present or within the previous three years with any organizations that might have an interest in the submitted work. Other relationships: All authors have declared that there are no other relationships or activities that could appear to have influenced the submitted work. Palejwala et al. This is an open access article distributed under the terms of the Creative Commons Attribution License CC-BY 3.0., which permits unrestricted use, distribution, and reproduction in any medium, provided the original author and source are credited.